The world of running is all too familiar, strong legs, body, gait, greatness and glory - we've all seen it before. To launch the GEL-KAYANO 25, ASICS’s biggest shoe release to date, we focused on the most injury prone muscle – the mind. As it’s not the strongest legs that stand the distance, but the strongest mind. 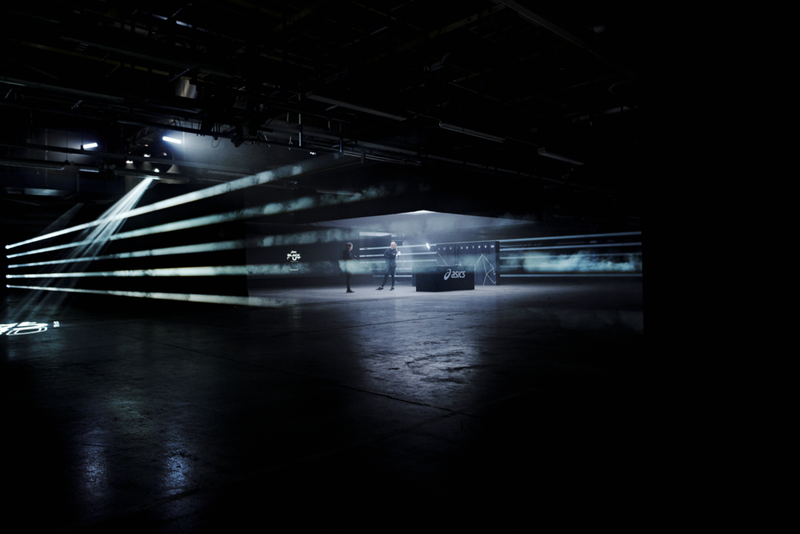 This lead us to 9 months of developing our idea and vision with sports scientists to create the world’s first running track to train the mind – ASICS Blackout Track. Without having any reach of TV or mass media we stole the spotlight on Global Running Day and started a new conversation on mind training. 35 athletes and running enthusiasts flew across the world to put their mind to the test. We stripped them of distractions - phones, music, smart-watches, scenery, competition and finish lines. Running on a 150-metre track in complete darkness through a vacuum of white noise, blocking out the sound of their own footsteps. Athletes saw a decline in their 5K times by an average of 60 seconds - the difference between winning a medal or not in competitive endurance sports. Globally, runners took on their own ASICS Blackout runs, through a feature we created on the Runkeeper app - over 10,000 users took part in the first few days of going live. On National Pizza Day - Feb 2016, Domino's launched their greatest invention since the pizza, 'The Easy Order Button'. To celebrate the launch, we created limited edition real life buttons that worked with an app, so when pushed your favourite pizza would be delivered in minutes. Buttons were sent to celebs like Jonathan Ross to create PR and further buzz on social. Fans could get in on a slice of the action by entering our social competition to win their very own Easy Order Button. Home baking is more often about mistakes than perfect bakes, proven by 2.5 million monthly searches for fixing baking fails. Using the top 20 keywords from those searches, we created easy recipes on how to rescue these fails. Now, when bakers looked to ‘Chef Google’ for help, we served them ‘Unfudged’ recipes as bite-sized content optimized for search results - driving consumption occasions by getting the right content in front of the right people at the right time. We are currently developing more exciting work for this global campaign. As part of the global new positioning for adidas football #bethedifference we created a 2015/16 kit launch campaign for Juventus FC - ‘OUR WAY OR NO WAY’. It's a belief that defines Juve’s game and partnership with adidas. The film concept is simple - destroy the pop, hype and drama that surround the game. The campaign included film, posters, press pack and store window display. Launch stunt concept also attached so you can see how we saw this being played out. Yes, we do beauty too - understanding Max Factor's world of glamorous make-up artistry was no small task. And being our first time on a beauty brand at a global level made it a very exciting proposition. 4 months later we achieved beauty guru status. Creating TV ads and fully integrated campaigns for Max Factor's new innovative products and make-up artistry for 2017's iconic looks. It wouldn't have been possible without world-class talent - fashion photographer & director Camilla Akrans and Victoria’s Secret superstar angel, Stella Maxwell. Masterpiece Lash Crown Mascara, the finishing touch for any queen. Let the majestic look reign. Not just another beauty ad, no other foundation can make this audacious claim. Tapping into everyone's everyday online social behaviour, we created the Joyville LOL FEST. An online festival where Cadbury's Dairy Milk rewards you for spreading joy - LOLz - through your social networks, to make the nation a happier place. Reaching LOLz targets unlocks unique tents - the world's first machine to tweet in chocolate (fact), choc-mobile car racing and chocolate pressed playable records. After helping develop the online platform 'Altogether Better' with Barclaycard, the client wanted to launch with a social campaign. We know financial institutes mostly get abuse on social media, especially a famous one, so it was important to form an idea that was both low engagement and rewarding. With this in mind we set out to make a film that wasn't possible without Barclaycard customers getting involved. This is their film. After Nespresso spent 6 years meticulously crafting beans in darkness its first vintage coffee was born, Selection Vintage 2011. A true limited edition, only one batch was ever made. Our launch idea centres on ‘crafted by the hands of time’. Beautifully bringing to life the expertise in its 6 years story. Since darkness is where the magic happened, it inspired our visual style with symbolic imagery that reflects the luxurious, sensual quality of the coffee experience. Matured in oak barrels, Magners is made in the dark for a better taste. It’s the magical ingredient. So when the Irish cider brand wanted to make Magners the summer drink of choice, we launched a nationwide search for urban areas in dire need of a makeover. Of course, these makeovers would happen overnight. In the dark. Then all summer, these cider gardens would be the perfect place for people to get together over Magners, enjoying local acts and artists invited to showcase their talents. People could even experience the Magners great outdoors indoors with limited edition packs that could be planted to grow their very own cider apple trees. We were tasked to create a future of mobility film for Nissan in 2020. To achieve this visionary piece we thought about how Nissan could be inspiring, frictionless and an indispensable part of people’s lives from browsing, owning or even renting a Nissan. The ideas were brought to life through infographics and a customer experience that clearly demonstrated how intuitive technologies are seamlessly connected with everyday life. We teamed up with Lomography and created a bespoke Wrangler Lomo camera for customers to win by simply trying on a pair of jeans. The shopper experience included window displays, interactive denim units, store posters, DM for retail outlets and a site where customers could claim their limited edition Wrangler Lomo camera. We won the Pan-European Wrangler account for Elvis with this idea - 'Second Skin'. It's all about highlighting the individual beauty of human skin while revealing Wrangler's contemporary fitting denim. We used renowned photographer John Ross, famous for his abstract album cover artwork, to appeal to a youthful audience across Europe. This behind-the-scenes clip shows the scope of the campaign. We use our eyes to connect with other people all the time. Yet it's curiously difficult to explain (interestingly, there's no words for it in most languages). It’s those moments when our eyes meet with someone else's and instantly we know what the other is thinking - not a word needs to be said. You both get the feeling that 'someone gets me and I get them'. Red eye and dry eye creates a barrier to these moments of the eye contact, making it more difficult to create a connection. Thankfully, Visine removes this barrier, leaving you free to use your eyes to see and feel more connections every day. Logic Pro, the new e-cig on the market wanted smokers to know it's here, so the summer launch activity needed to arrive with a bang, and obviously lots of smoke. To drive trial and purchase we tapped into what the audience love this time of year, long summer days - the 'Summer Night Projects' was born. Unexpected events on roof top bars where contemporary smoke artists such as Banks Violette lit the sky at night with inspiring shows of giant vapour projections, which stopped people on streets and got everyone together. This brand affiliation with hip roof top bars and artists gave Logic Pro a credible cool factor, and became a springboard for more innovative spectacles in the year. Intel and Codemasters teamed up to promote Intel’s new Core processor with the latest F1 2015 game launch. Gamers worldwide clock up hundreds of hours perfecting their racing skills indoors, but unlike real F1 drivers, there’s no credit for their efforts. So we created the world’s first F1 2015 Indoor Season by finding a gap in the F1 calendar that Intel could truly own. Partnering with Twitch, the gaming social platform - gamers and F1 fans around the world became real champions with real trophies. When trying to book holidays, flights or hotels in India, it isn't as hassle free as it should be. Cleartrip is the only travel site in India that makes the booking process as simple as possible. So we positioned the brand as 'CLEAR', well it's in the name. This went against all the competition that's filled with flashing offers, complex user experiences, surplus ads and hidden charges. With India’s chaotic travel process everyone’s looking for a clear way of doing things, so quick 10-15 second TV spots were created (A first for India) followed by a series of simple graphic outdoor posters and social activity. These days families are spending less time together with the likes of smart devices being used as 'babysitters' to keep their kids entertained so parents can get work done or have some me-time. We wanted to flip this around through a McDonald's Happy Meal digital platform. We created several engaging experiences through a 'Happy Studio' hub that inspired kids and parents to play together in restaurants, at home and out of home with their Happy Meal toy - after all McDonald's stands for bringing people together. McDonald’s new brand positioning ‘good times’ needed a new social approach to help change perceptions by the public - as most people interacting with its social channels complain. However, there’s an incredible 74% of positive conversation about McDonald’s outside of its own channels. We felt it was only right to champion and reward this brand loyalty. By talking to customers on their level, making our fans social heroes, using their photos in our ads and overall be more tactical in everything we do. We were lucky enough to work on this amazing Nike football experience - how do we get London kids excited about Nike Scorpion Football. 3 on 3. 3 minutes. First goal wins. We got kids from all London boroughs competing with each other. Hundreds of thousands of kids got involved and outdoor posters across London got everyone talking about the pre-world cup football tournament. To drive stand out in a very cluttered on-the-go water bottle market, we made a splash with an Augmented Reality game for drench. The first of its kind in this sector. Triggered by the on-pack 'Clever Goldfish', the online game allowed consumers to play out the brand proposition of simple, memorable, amusing and radical to win health-focused prizes. Virgin Holidays is made up of several brands but thousands of staff don't know the ins and outs of each brand. So we were tasked to educate them with lots of 'brand' information for a nationwide staff conference. Now we didn't want to bore them with all the benefits of each company, so we bought this to life using the brand principles of 'Rockstar Service' and its quirky tone of voice. With a miniscule budget we turned it around in 9 days, from scripting to delivery of film. All complete with a set of personalised postcards for each of the attendees from our host, Les Vegas. To promote Virgin Holidays worldwide midseason offers we created a series of press strip ads with a bit of Virgin cheeky tone. Pilgrims Choice wanted to stand out in a saturated cheese market. We gave the brand a cheeky new tone of voice and character that would make any food melt. The client got really excited and started thinking ahead - 'I can imagine a 48 sheet saying I love baps in all sizes'. Not bad for a first meeting. And yes, he really did say that. There's less than 1,800 wild tigers left in India! To help protect them we worked with tiger conservation veteran, Julian Matthews to establish an advanced tiger charity in the market. We named it 'TIGER NATION' and created a network helping protect tigers in the wild, where subscribers connected to tigers using revolutionary tiger tracker technology. We helped launch the charity in the UK and India by creating it's name, logo, brand identity, website and brand awareness globally. The Honda CR-Z is a sports hybrid, the first of its kind for Honda and it's pretty hot too. To match this surprising car, we created a launch campaign that at first looked like a traditional new car commercial, but when clicked to play, the CR-Z burst out of the 'fourth wall' with Honda engineers Yin and Kai leading the way. This formed our campaign ‘Launch Hijack’ where Yin and Kai took the car for a test drive but never returned it. We challenged the public to help find the car - whoever found the CR-Z would win it. Various events would take place at cities where Yin and Kai were spotted to bring the CR-Z features to life. People don't pull their vegetables from the ground anymore. The closest they get to harvest is putting a few pounds in a Tesco's bag. The Indian Bhangra dance was formed from harvest movements. So I created Nachda Bazaar, meaning Supermarket Dance. Where each dance move comes from the movements people make in the Supermarket. The film has been part of exhibitions at the Air Gallery in Mayfair, The South London Gallery and The Truman Brewery. While the world was getting excited about the upcoming World Cup, there was something far more dangerous about to kick off between two rivals - the possibility of nuclear war between India and Pakistan. So to make a point and bring awareness about the bigger game, we had a kick about around London, in our own bespoke nuclear kits, complete with a hazourdous ball. The guerilla stunt made the press, including write-ups in Sleazenation and Creative Review. We were selected to create an exhibition piece as part of a 'CREATIVES' show. We knew everyone else would be showing their work but we wanted to stand out, so decided to put hundreds of disposable cameras on a wall. All surrounding a centrepiece 'WE MAKE THINGS WORK'. The audience could interact with the cameras by simply pulling them off the wall and following our instructions on how to re-use them.